That first card sure looks spectacular. Do we know what spectacle does? **** yeah, Mortify is my ****'ing jam. It's a completely different thing atually, you can't compare 2 to 4 mana. It will probably see play though. That's kind of what I meant. I'm sure we will be seeing it played a lot but also, yah, it's a bigger, better pyromancer pretty much. Yeah, control had problems with enchantments. Good, versatile card for esper. another answer for experimental frenzy is good enough for me! Interesting, the Four mana uncommon cycle is confirmed to still be there. For once I don't care about power level, this is just a 'cool' card and I like it. 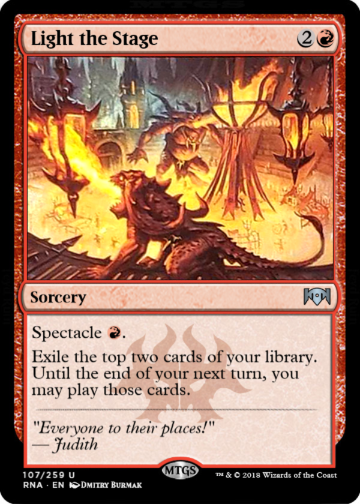 Also, this set, so far, is basically all hate cards for Modern. Pretty cool, I guess, but nothing that will matter much in Standard (Arena) so far. Well, Except maybe for Light the Stage, which is probably super powerful, but I want to see how it actually plays out in testing. 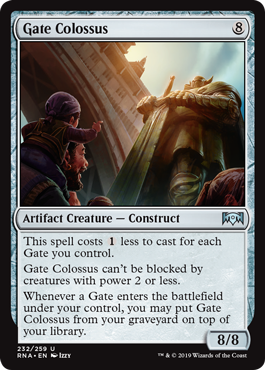 That's got to be one of the better RdW card-advantage cards I've seen in a long time, possibly ever. Pay one, draw two, can play from exile. I.e. 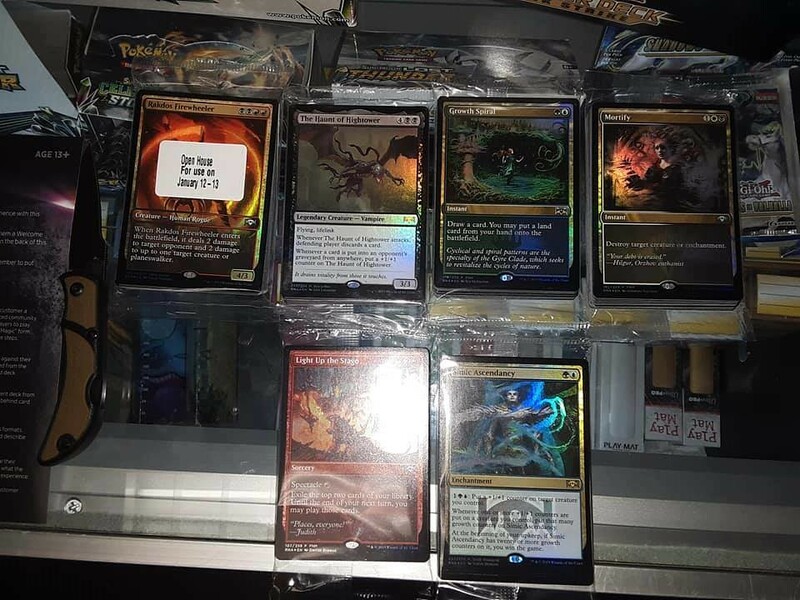 : Lands are even good draws here. All you need to do is deal a single point of damage, which I hear Red is usually trying to do in any case. I'd assume it's going to be good in basically any cheap-spell aggro decks. Cute card, but I think nah. 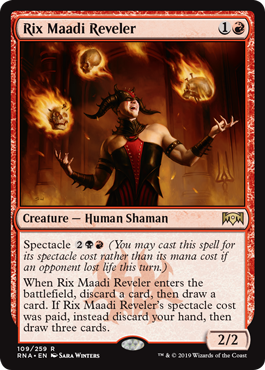 Bedlam Reveler was easier to cast, and cheaper. It saw some play, but nothing to write home about. Main improvement = human. Growth Spiral might get play, but it's not going to make waves. Mortify is a GREAT card, but I don't see the support (at this time) - meaning, we already have a great removal package in those colors, and they still aren't exactly top of the format for anything. If WB gets a lot of support, then yeah, Mortify will matter a lot. As it stands, it's decently costed removal at instant speed, but it might be in the wrong colors (we shall see, we've only seen ~16 cards so far). Esper Control is already T1.5 and it's missing two out of three guilds. Mortify would probably see fringe tournament play even if neither Orzhov nor Azorius got anything else. Which is not happening. Wha ya got against Devils? Instant: Destroy Target creature, artifact, or Planeswalker. edit: replaced with the English Version of the Card, for you non-French speakers. Last edited by DJ0045 on Wed Dec 19, 2018 4:02 pm, edited 1 time in total.